This Chicago Cubs ended the 108 year wait by winning the 2016 World Series. Big Time Bats has released a limited number of White W bats signed by Catcher and veteran leader Miguel Montero. The bats feature the iconic Blue W, the words "2016 World Series Champions," and all of the highlights of the 2016 season, including final Regular Season record, All-Stars, batting leaders, pitching leaders, and MVP award winners. Miguel Montero signed each bat, which is fully authenticated by MLB Authentics. Montero shared much of the catching duties throughout the regular season, and contributed a number of key hits throughout the post season. There was none bigger than an eighth inning Grand Slam against the Dodgers during Game 1 of the NLCS. These bats will not last long, so get yours before they sell out! 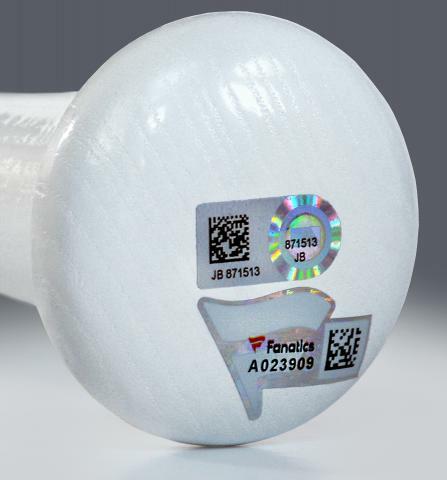 We have these IN STOCK and READY TO SHIP! Due to the limited nature of this offer we must charge your credit card for the full price immediately upon taking your order. This policy ensures we reserve a bat for you. We will confirm your order by Email. These bats are not game used. 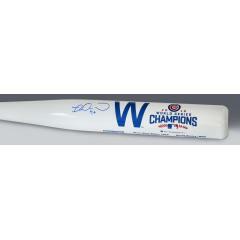 Miguel Montero Signed Cubs 2016 World Series Champs "W" Bat $295.00 Sold Out!